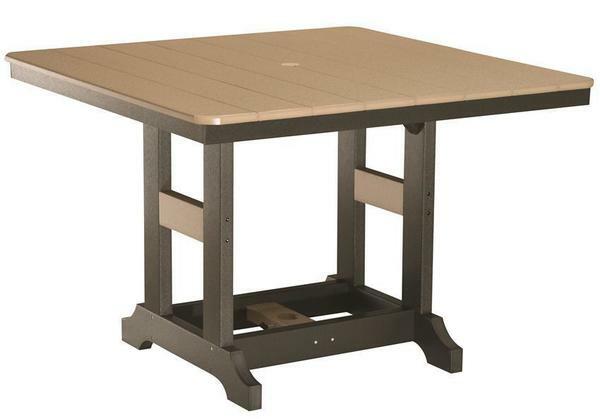 Berlin Gardens 44" Square Poly Patio Table - Counter Height 35.5"
A wonderful addition for your outdoor barbecues or a casual get together with the ones you love, our Amish Poly Garden Classic Lily Table is the perfect dining table your outdoor space! Each table comes with an umbrella hole and matching plug, so you can enjoy the shade on those warm summer days. Available in an array of beautiful poly colors, you're sure to find the right table to incorporate into any decor! Add our Berlin Gardens Poly Counter to complete your look! Poly lumber is an eco-friendly alternative to traditional wood outdoor furniture, which requires no regular maintenance, even when left outside year round. Poly lumber is created using recycled milk bottles and detergent containers that form a piece of lumber-like polyethylene. Each piece of poly lumber will have a beautiful, uniform color throughout, that will not chip, crack, rot, or develop mold and will require no repainting or staining, leaving you to enjoy your new outdoor furniture for decades! Counter Height - 35 ½"